The SDLP's Pat McCarthy has been elected as the fourth ever nationalist lord mayor of Belfast City Council. Mr McCarthy, who was first elected in 2001 and represents the Laganbank ward, will replace the DUP's Wallace Browne. DUP councillor Ruth Patterson has been elected as his deputy for what will be Belfast City Hall's centenary year. Mr McCarthy said he aimed to develop "a vision for Belfast". He added: "We have come through 30 years of turmoil and now must set our sights to the future". He received the backing of all parties in the city council except Sinn Fein to become the third ever SDLP councillor to hold the post. 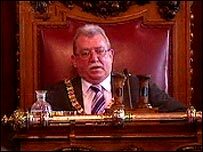 Alban Maginness was the first SDLP mayor in 1997, followed by Martin Morgan in 2003. Ruth Patterson said she felt "deeply honoured" to be elected deputy lord mayor, which she said was a "great privilege". On Wednesday, the Alliance Party said it would not back the Ulster Unionists for any top council posts because of its link with the PUP. Alliance holds the balance of power on the council and had said it would back Mr McCarthy's candidacy. The UUP has come under pressure over its assembly arrangement with the PUP, which has links with the UVF. # posted by SAOIRSE32 : 5:52 a.m.